A mosaic image of the region where the presumed water is. Blue represents water. After decades of debate, scientists have spotted hints of liquid water trapped beneath the planet’s south polar ice cap. 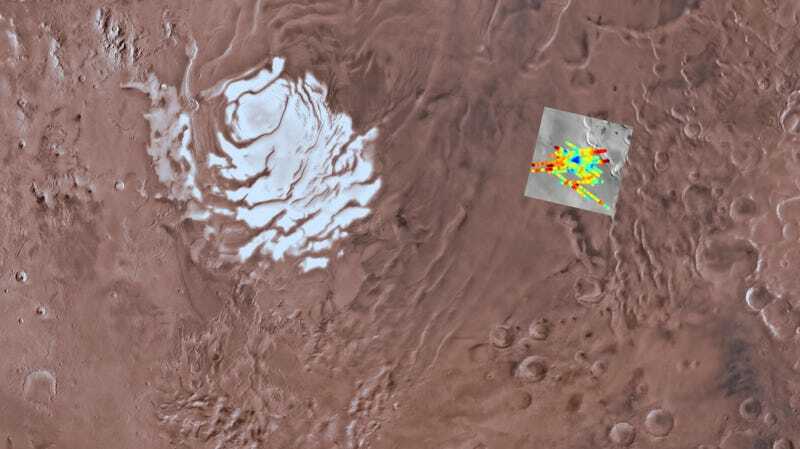 A team of Italian researchers analyzed radar data taken between May 2012 and December 2015 with an instrument on board the European Space Agency’s Mars Express spacecraft, according to a new paper. Parts of the ice returned strange signals in the instrument. “We interpret this feature as a stable body of liquid water on Mars,” the authors write in the paper published today in the journal Science. At this point, there’s lots of evidence that Mars used to have liquid water, based on its topography and other clues. And obviously the planet has frozen water, as evidenced by its ice caps. But whether there’s liquid water currently, either in the dirt or hidden beneath its poles, has long been a matter of discussion and debate. From May 29, 2012 to December 27, 2015, the MARSIS (Mars Advanced Radar for Subsurface and Ionosphere Sounding) instrument on board the Mars Express spacecraft took data on a 200-kilometer-wide (124-mile) area near the planet’s south pole. It shot radio waves at the ground, then recorded how the waves that bounced back had changed. There was nothing strange about the area itself. But a 20-kilometer-wide (12-mile) region beneath the surface seemed to reflect way more of the radar signal than its surroundings. The bright reflection implied that the region had a much higher value of its dielectric permittivity, an important electrical property for studying penetrating radar. The researchers weighed the options: Could carbon dioxide ice have caused the signal, or some other material? Their analysis suggested that, no, the most likely explanation would be water, which has a much higher dielectric permittivity than ice. That water would have lots of dissolved salts, either as a brine pool or a sludge where water saturated soil, according to the paper. Why doesn’t the water freeze? First, there’s the dynamics of ice sheets, which can experience sub-surface melting due to the specific pressure and temperature environment (as they do on Earth). Then there’s the dissolved salts. You might remember the phrase “perchlorates” from past Mars water studies—these are molecules that contain chlorine atoms linked to four oxygen atoms. The presence of perchlorate salts can greatly reduce the melting point of water. “The temperature at the bottom of the south polar cap supports the idea that this could be liquid water, because it’s in a brine where perchlorates could have lowered the melting point so it could be stable at this temperature,” Tanya Harrison, director of research for Arizona State University’s NewsSpace initiative, told Gizmodo. Harrison was not involved in the current research, but has studied Mars in the past. This detection is the next big clue in the mystery of whether liquid water still exists in measurable quantities on the Mars today. You might be familiar with the “recurrent slope lineae,” or RSLs, on the planet—streaks on its surface that appear to darken. A much-hyped paper announced this as “strong evidence” for liquid water back in 2015, but another, more recent paper suggested there could be a better explanation for the darkening. This new paper offers another, probably unrelated source of liquid water. “This story provides corroboration that liquid water can exist on Mars,” Lujendra Ojha, author of the 2015 RSL paper from Johns Hopkins University, told Gizmodo. “It’s probably going to be transient and salty, it will most likely be subsurface... but I think it’s a bit of vindication.” And if it exists in the ice caps, perhaps it exists elsewhere, like the RSLs. There’s lots more work to do. 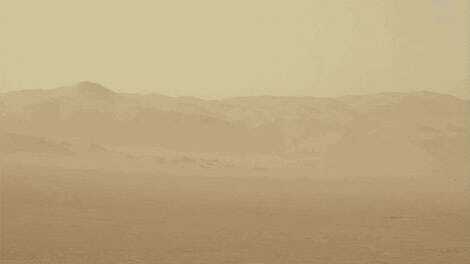 A visit to Mars with the right tools is what would be needed to confirm or rule out the presence of liquid water. And, of course, this new paper says nothing about the presence of life—it’s unclear what kind of life form, if any, could survive in this cold brine. But a standing body of water is always intriguing.